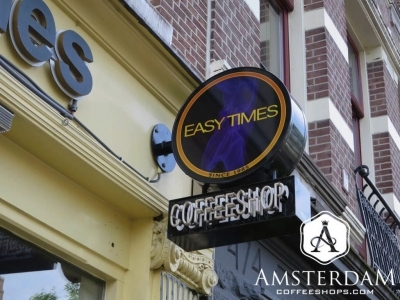 Easy Times Coffeeshop is located on the Prinsengracht (Prince’s Canal), close to the Leidseplein. The immediate neighborhood surrounding this establishment is highly commercial. Walking the narrow streets here, you will find seemingly no end to the number of small restaurants, bars, munchies sellers, and souvenir shops. As you would expect, this area is also densely packed with tourists. 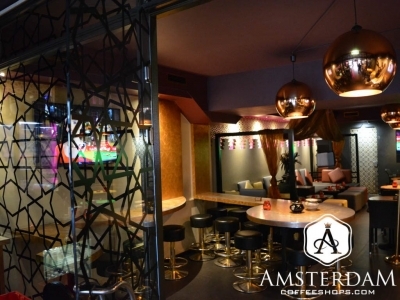 This is one of the more popular destinations in Amsterdam, especially in the evenings. If you are looking for a lively night out, the neighborhood around here may be a good option. This coffeeshop is quite modern in its appearance. 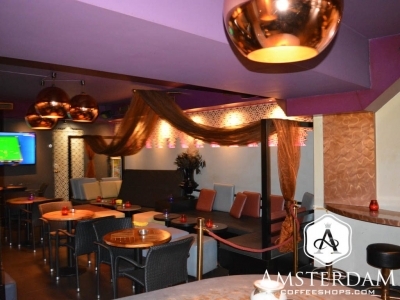 Easy Times is best described as a mix between an upscale cafe and urban nightclub. One of the first things you notice as you walk up is the outdoor seating. The sidewalk extends out quite far, and the building Easy Times sits in is relatively wide. This provides ample room for five or so tables and accompanying chairs. The tables are polished wood, a nice touch. There are also a couple of potted trees outside, which really adds to the “al fresco” patio feeling. Remember, this is a prime canal-side location. Their outdoor seating is hard to beat on a warm day or evening. Velvet ropes mark off the entrance to the shop itself. 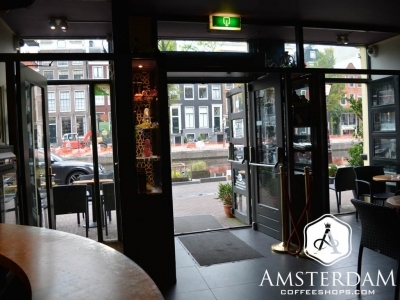 They lead you inside, where you will notice a coffeeshop with a bit of a nightclub vibe. 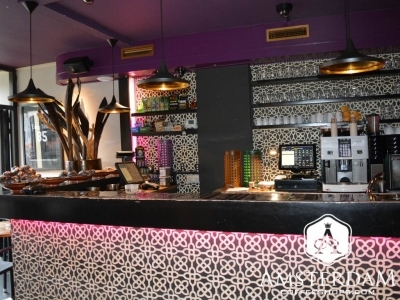 Leather stools and seats, curved modern tables, glass partitions, and purple accent lighting all add to the effect. The shop is divided into two rooms. In the front is the main counter. 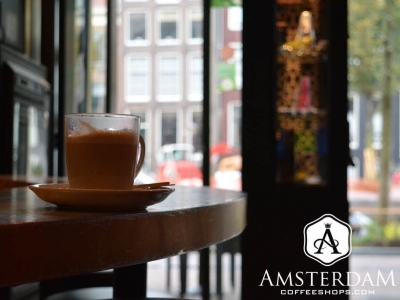 Here you can order cannabis, along with an assortment of coffees, teas, juices, and drinks. Of note, they make fresh mint tea and milkshakes, so it is a bit more than a “just the basics” kind of place. In the back, you will find the shop’s smoking lounge. It is behind an entire wall/door of glass, and has a very open feeling. The cannabis menu in Easy Times Coffeeshop is quite extensive. They tend to list well over a dozen strains on the flower (weed) side. Here you will typically find a good mix of contemporary and old school strains. If you are looking for a popular new West Coast USA strain, it might be here. While not as extensive, their hashish menu tends to be quite formidable as well. Further, the quality of many of their pressed imports is often great. You are sure to find something soft, strong, and flavorful here. They also sell pre-rolled joints and edibles. The latter selection is quite good, and includes a variety of muffins, brownies, and cakes. Vaporists will likely appreciate the two Volcano vaporizers, which are setup on their own table in the front room. Note that we have flagged Easy Times as one of the city’s better Vapor Lounges. 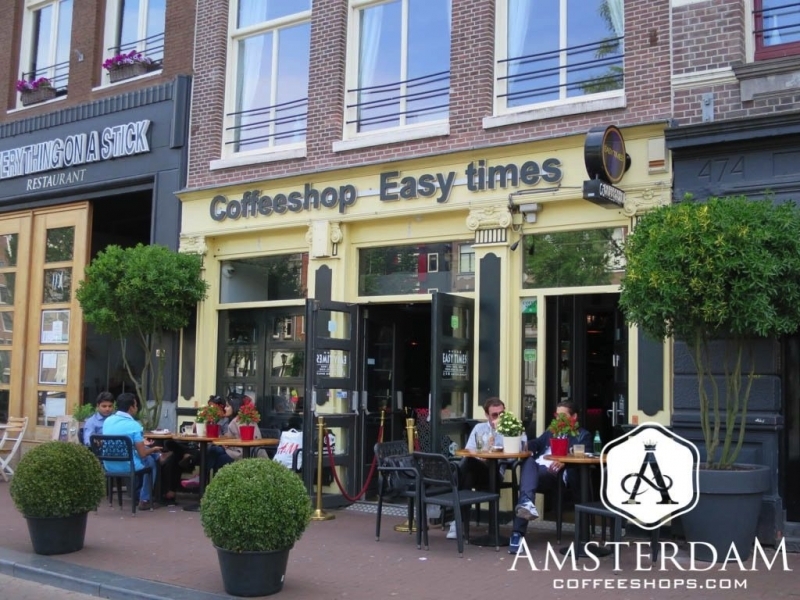 Easy Times is a coffeeshop with an alfresco cafe vibe during the day, and a trendy nightclub vibe after the sun goes down. 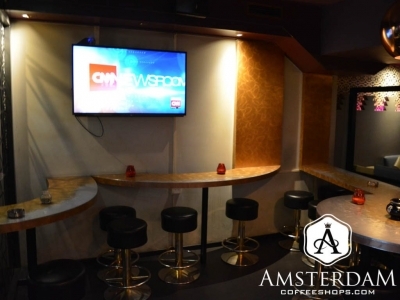 The decor is clean and contemporary, and the cannabis menu extensive. This is an excellent establishment, worth a visit if you are in the area.